As you can tell by the pictures of my boys....time sure does fly. The photo on the left is Jim at age 3, the photo on the right is Joey at age 3 - with their "first catch". The photo on the bottom was taken this past September - Jim 12, Joey 11. 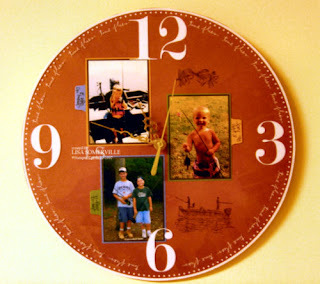 I just recently got these cool Heidi Swapp Clock Overlays from Betsy at Innovative Stamp Creations - these overlays fit perfectly into a clock, or can be used on 12x12 layouts. These overlays would make an awesome Father's Day Gift! I've got another one to share with you tomorrow. That clock is amazingly beautiful!